Last week I promised to give you my recipe for the best collard greens that the world has ever known. I’d like to take credit for this recipe, but actually, it came from my mother, Sarah Windham. 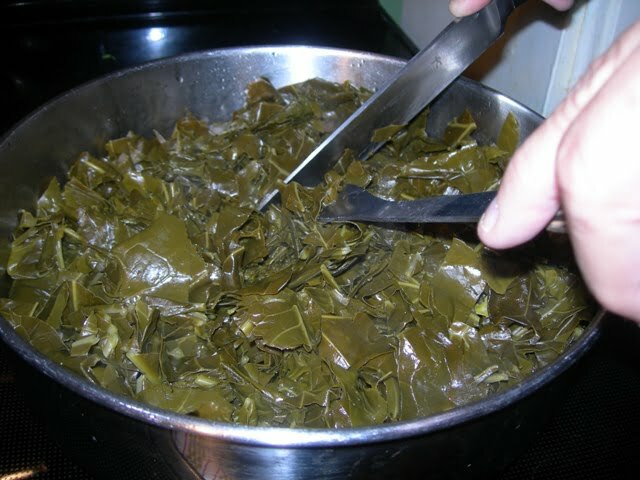 I’ve never had a Thanksgiving or Christmas dinner without collard greens. That’s just how we eat at Windham’s Crossroads. So here goes. The first step is selecting your collards. We are fortunate that we can just go out into our garden and cut some. Lucy came out to help. If you don’t have a garden, I suggest that you buy your collards at your local farmer’s market. You may even find a farmer selling collards out of the back of his pickup truck by the side of the road. If you see that, pull over. At the last resort, you can buy them in a bag at your grocery store, but I never have. Lucy and I cut two bunches this morning after our very first substantial frost last night. I’ve always heard that collards are best after a frost. I’m here to tell you that I cooked some last week that were very good, but not nearly as good as the ones that have been touched by frost. The first thing I do is to de-stem the leaves. I remember going to a gourmet restaurant in Charleston, South Carolina. I ordered some collard greens as a side dish, and the waiter brought a green glob of something with huge stems in it. I called the waiter over and said, “The chef ain’t from around here, is he?” Oh well, I digress. I usually do this outside at the picnic table. Using a paring knife, I make a cut on each side of the stem. You can throw away the stems, but I put mine in our compost bin. Then I hand the de-stemmed leaves to Jane. She takes them into the house and puts them into the sink. She rinses them with cool water. 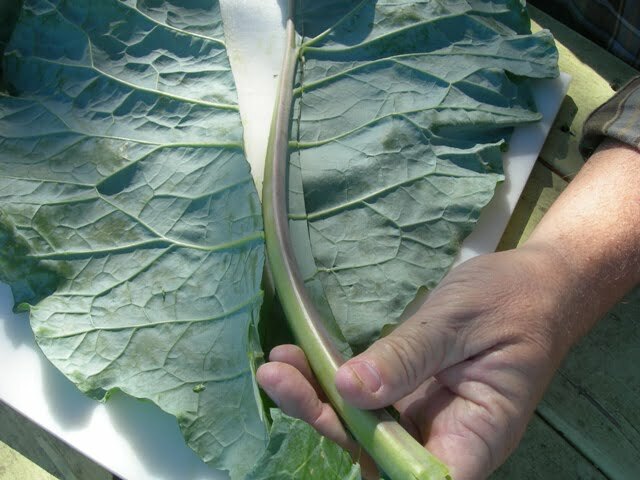 Our collards are clean, but sometimes you will need to wash them twice to remove all sand or grit. Now take 4 or 5 leaves and stack them together. Roll them up like you’re making a big, fat cigar. 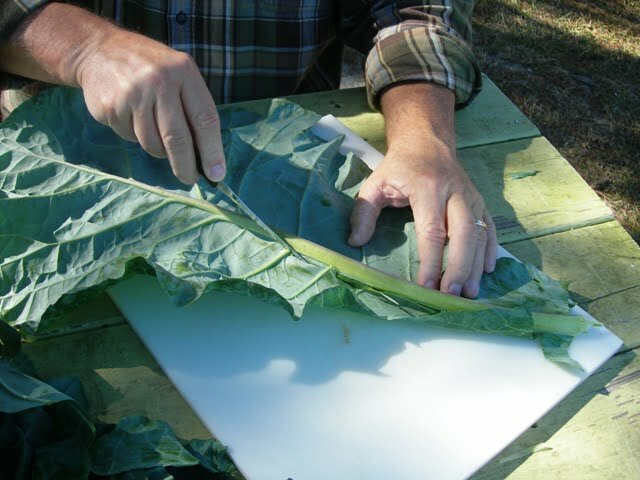 Rolling the leaves speeds up the process of cutting the collards. 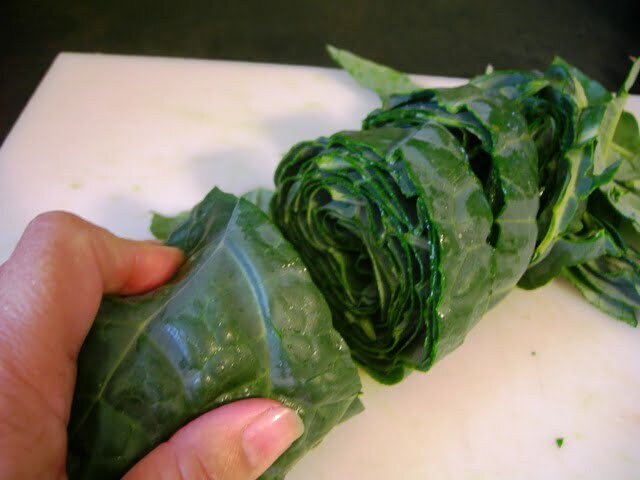 Cut the roll every 1/2 inch, giving you strips of collards. 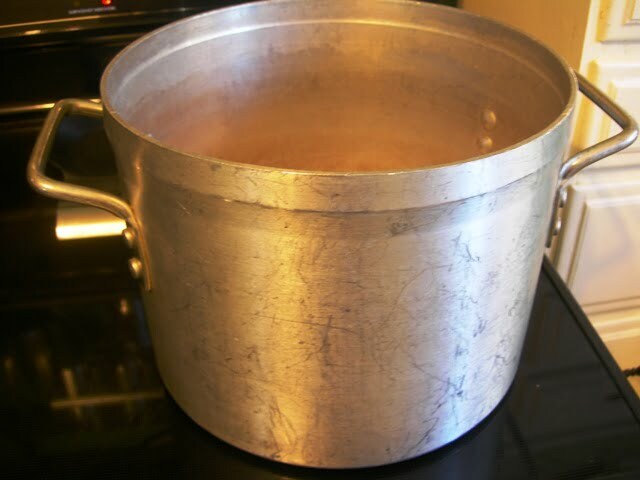 Now get out your largest pot. I use a 10 quart pot. You are going to need something to season the collard greens. Put about 4 or 5 slices of fatback in the bottom of the pot. 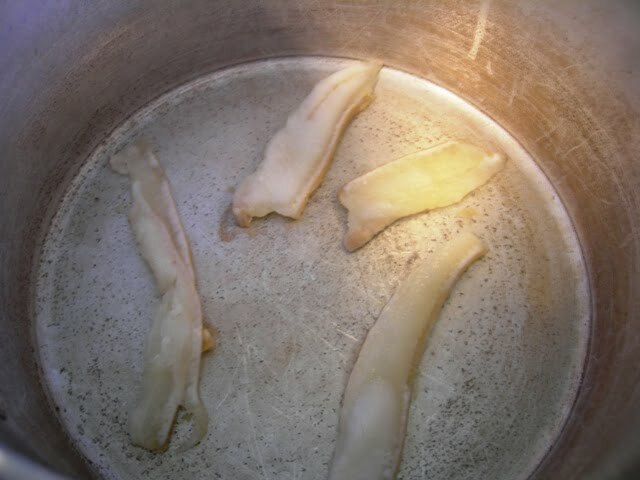 You need to render some of the fat out of the fatback by cooking it for a few minutes on high. Leaving the strips in, fill the pot about half full of water. 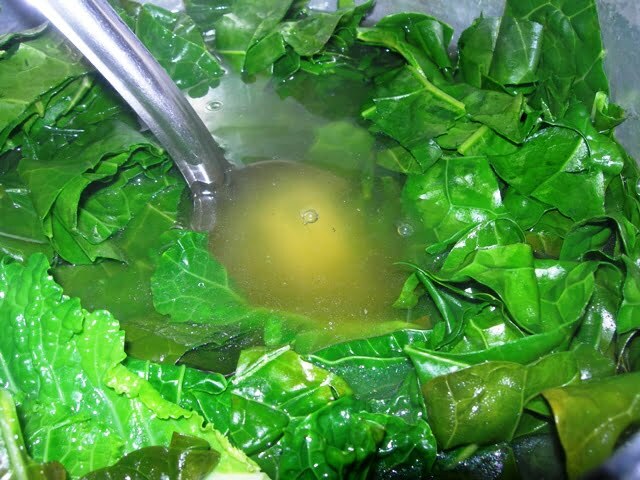 Bring the water to a boil and add some of the collards to the pot. You won’t be able to get all the greens into the pot at one time. Let them cook down a bit and add some more. Keep pushing them down into the liquid until they are all in the pot. Add salt, black pepper, and garlic salt to taste. Continue to boil for about 30 minutes, lower the heat, cover and simmer for about 1 1/2 hours. How do you know when they are done? Pull out a strip and taste it. It should be tender and taste good! Put them into a colander and let them drain. Cooked collards won’t win any beauty contests! Remove and dispose of the fatback. By now your whole house smells like cooked collards. Some people don’t like that smell, but I do. Smells like home to me. While they are draining, get out a large frying pan. Do not use a nonstick pan because you will be cutting the collards in the pan. Fry a half pound of bacon. Remove the bacon, and put the collards into the pan with the bacon grease. Reduce the heat to medium. Sprinkle 3 tablespoons of sugar onto the collards. 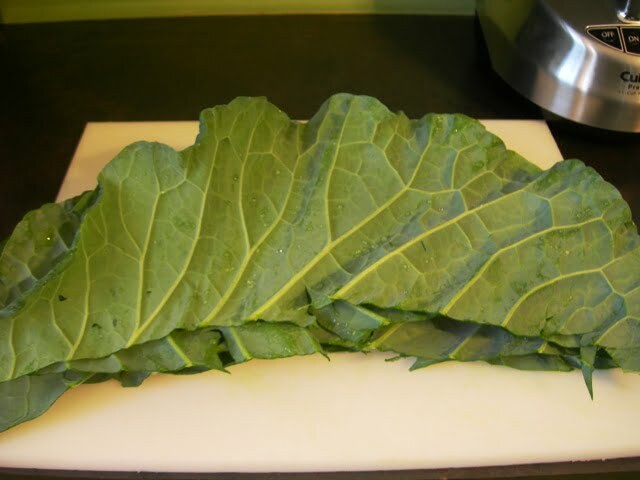 Cut the collards into smaller pieces in a criss-cross fashion. Don’t get lazy here. You need to cut them thoroughly. Let the collards cook until all the water has evaporated. Be careful not to burn the collards, and stir them occasionally. When all the water is gone, they are ready. To serve, put the collards in a bowl and crumble the bacon on top. After they’ve been plated (I heard that term on Food Network) add a touch of vinegar to enhance the flavor. I prefer to use homemade hot pepper vinegar. What do you serve with collards? Tonight we had country ribs and rice and a baked sweet potato. That’s about as Southern as it gets. When you look at a plate like that, it makes your tongue slap your brains out trying to get to it. Now that’s good eating! Hi Leo! Beautiful, wonderful, fantastic recipe for collards. I didn’t cook mine long enough last time. 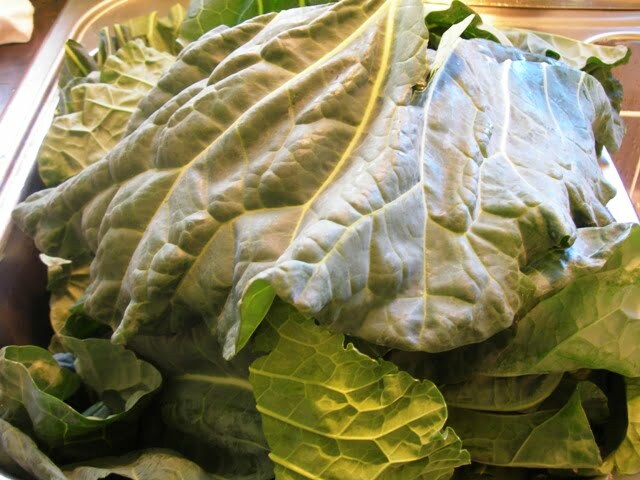 I am going out to the garden and pick me some collards and use your recipe. Thank you so much. I am a gardener up in Canada and appreciate your sharing your recipe. This recipe looks like a good one. 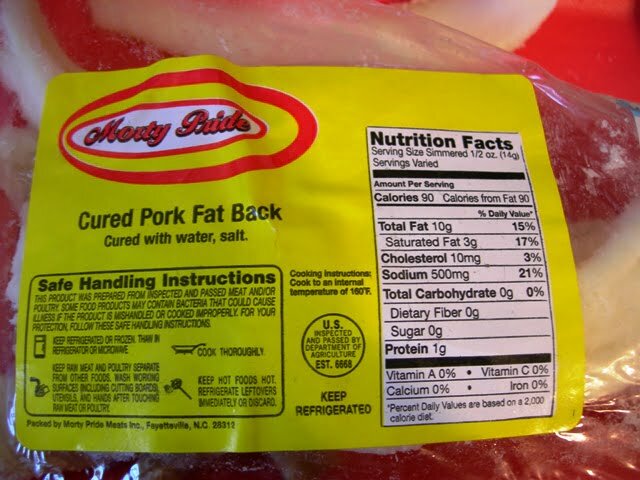 I’ll use ham hocks for saltiness and final topping at table, but salt pork/side meat starts yours off right. Nice work, Leo! I sure do wish that I could grow collard greens in my backyard. Every time I get them growing Mr. Rabbit comes along and eats them. I have tried fencing around them and a few other tactics but I guess he loves them just as much as I do. Can’t wait to try this recipe. These look wonderful! I just had a mess of collards for dinner last night, along with some soup beans, onions and cornbread. Ate the leftovers today. Have you ever pressure canned collards? I can turnip and mustard greens, poke and creasies, but have never tried collards. This might be the year, especially since all the other canned ones are gone except the poke. This looks amazing! Can’t wait to try, sharing on the blog later today. My husband badly burnt collards in our house. How can I remove the odor? These look amazing! My family won’t eat them, but I may just make them for myself… I swear I think I could eat only greens for days! Happy New Year Jane and Leo! This is my first visit to your blog and I LOVE it. I’ll be back and looking forward to more news from you. I am a southern girl too, so your blog reminds me so much of my grandparents farm and fun times I had as a child. Man, you just made me hungry! This is not something I would have ever thought to do with the greens. How sweet of you to post the recipe. We cook very different in the north. Well Leo you are making me hungry! One of my favorite things to eat! 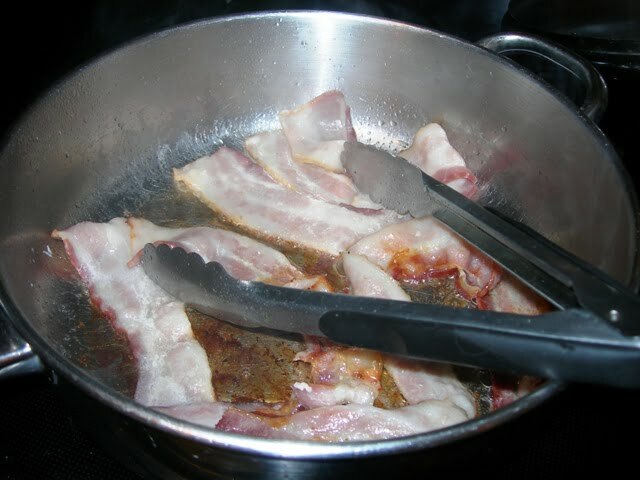 I cook them using my Grandmother’s recipe, but I have never thought of finishing them in a pan with the bacon grease. I’m going to try it next time. 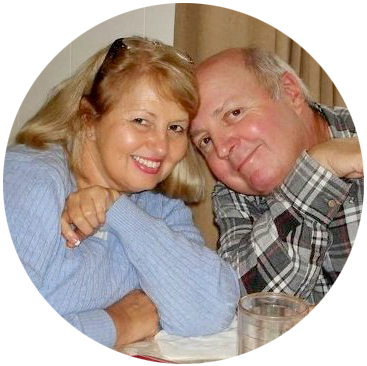 Drop by my blog sometime! Collards are one of my all time favorite greens, love them. Your recipe sounds soooo good. Now I feel like cooking up a big ole pot . Leo, I never pour the water off after the collards have cooked. That is what we call pot liquor and it is wonderful with cornbread in it. We grew up eating it because there was no baby food in 1937 !!! I have never ever tried collard greens (it is not common where I am in Toronto), but they look yummy! I knew there must be some secret to making collard greens palatable! Thanks for sharing! Lucy looks like a great helper! Leo, thank you! I love greens and will give your recipe a whirl. You know what, I have never eaten collard greens!! Seeing your wonderful recipe makes me want to try them!! 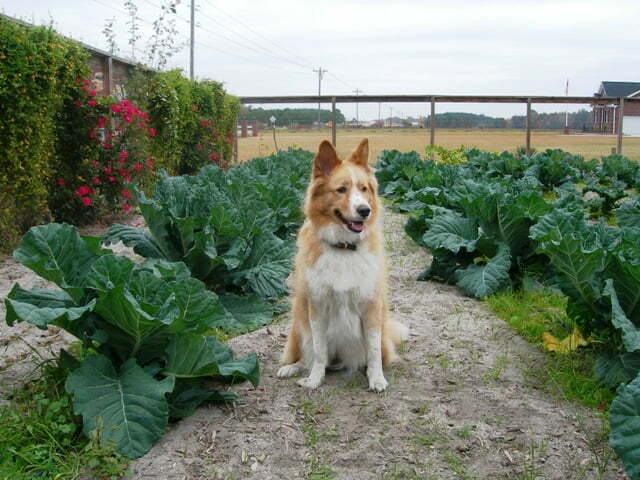 I just love the photo of your dog in the Collards. 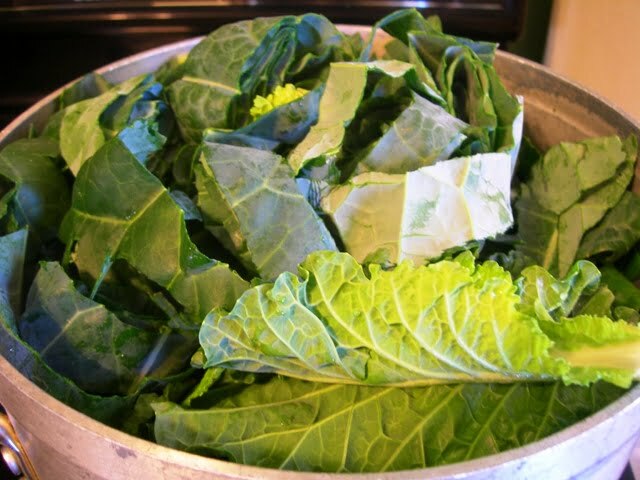 We grow Collards and there is nothing better than a great pot of Collards cooking on the stove. Your recipe looks awesome! 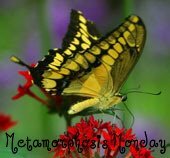 Thank you for sharing and have a wonderful week! 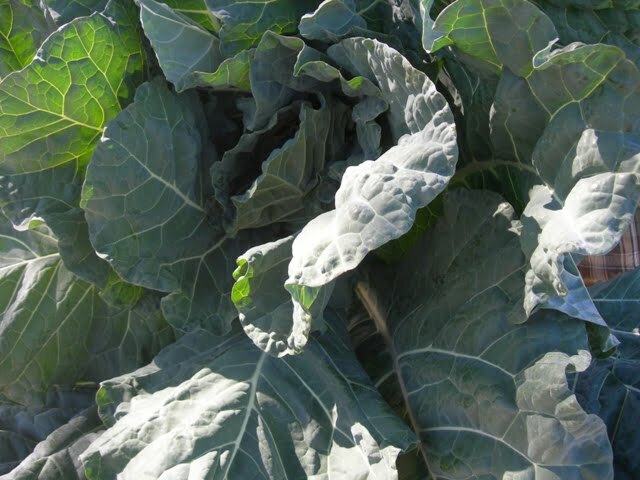 We still have some black kale or dinosaur kale in the backyard garden…I am going to give your recipe a try with the kale instead. Thanks for this recipe! Your plate looks fantastic!! I prepare my collards the same way. Learned it from my mom and grandma. My grandma always said “they ain’t no good til the first frost has kissed em!” I believe her wholeheartedly! Definitely southern! This is very similar to the way that I cook them, can’t go wrong with the addition of crumbled bacon! Thanks for sharing Leo! I have to tell you a funny. 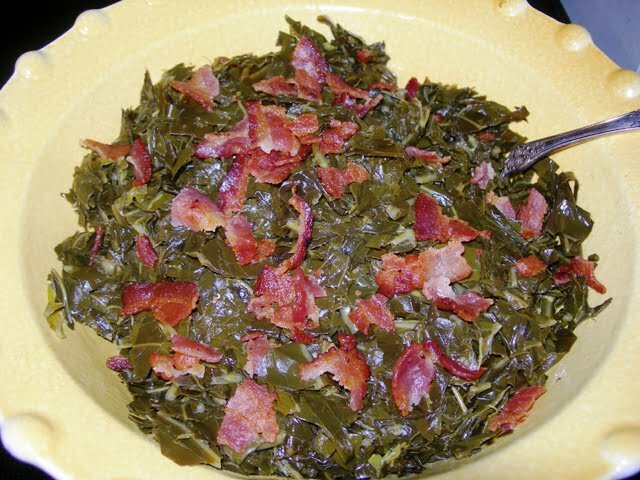 When my daughter moved into her own apt., BLESS HER HEART, she had a can of collard greens that she was going to cook, so she called me and said, “Mom, what do you do to collards when you ‘lookum’?” I just died laughing and told her that I was saying “look them”. She thought maybe it was something like sautee them. She had heard me say that I loved collards but I did not like to cook collards because you had to “look um”. Folks, that’s as southern as you can get. Of course we still have a good laugh every time we eat collards. I have never. had. collard. greens. I feel extremely left out. Cracker Barrel is as Southern as we can get here in Montana, but I’m guessing that even if they serve collard greens, they probably don’t compare to these! I’m a little embarrassed to say that I’ve never had them, but I’ve wanted to. After seeing this I want to try them even more so. p/s love the way you rolled up the leaves into cigar shapes to cut..smart! I LOVE collards! I planted them for the very first time this spring. They are extraordinarily prolific! We planted 6 small plants and we have fed our whole end of the county it seems! I am not from the south, so I have been relying on Paula Deen’s recipe and my family loves them. 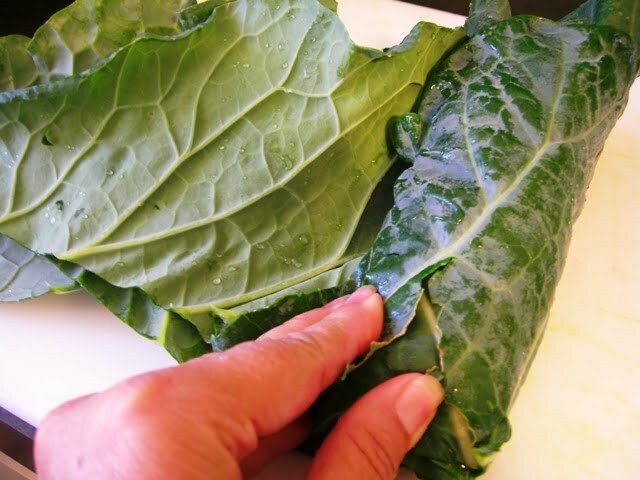 Now I am giving your collard recipe a try! I almost pulled mine up. Good to know that they taste better after a frost. YUMMY! Deb wants to know what time we need to be there for the next cooking…..She hardly eats other peoples greens but she says she`s ready to try these…..We grew up listening to you and Woody,so we feel like family.If we don`t get an invite we`ll try to duplicate your recipe and let you know how it turns out.Thank you for post. 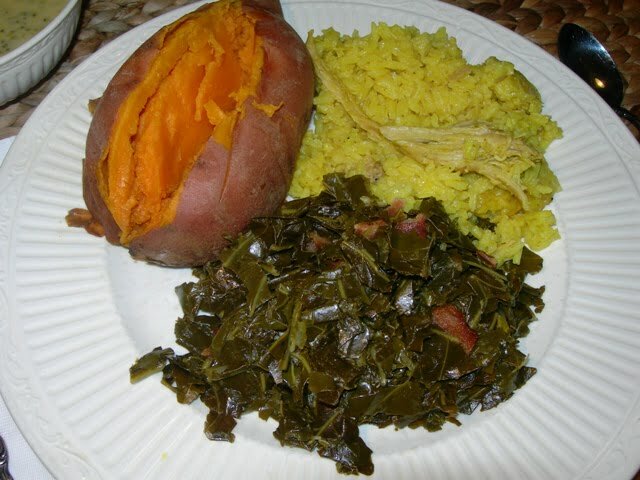 My husband would kiss you after this recipe LOL…he loves collards, only since moving to the South. Just found your blog. 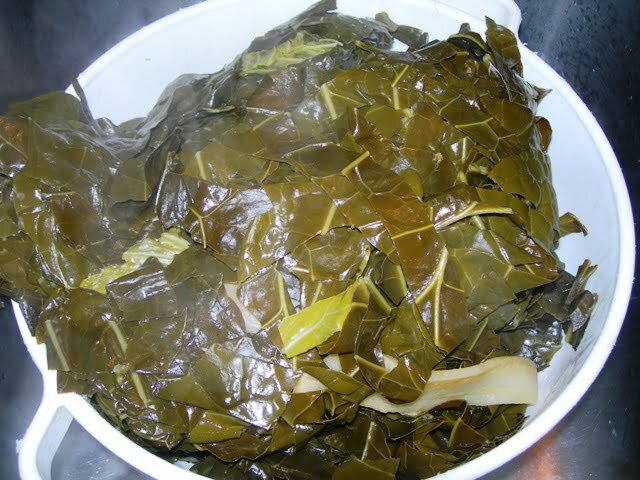 We are originally from the South and love collards. That meal sounds beyond fabulous. Wow, takes me home without the 12+ hour flight/drive/airport time. Leo, I was checking out behind a very well-heeled appearing lady (looked northern) at Boone Hall yesterday and she was buying a mess of collards and a bottle of white wine. Wanted to ask but didn’t. Pam likes your recipe. She’d never had collards til moving South…now she loves’em. Nothing brings back memories like reading about collards. 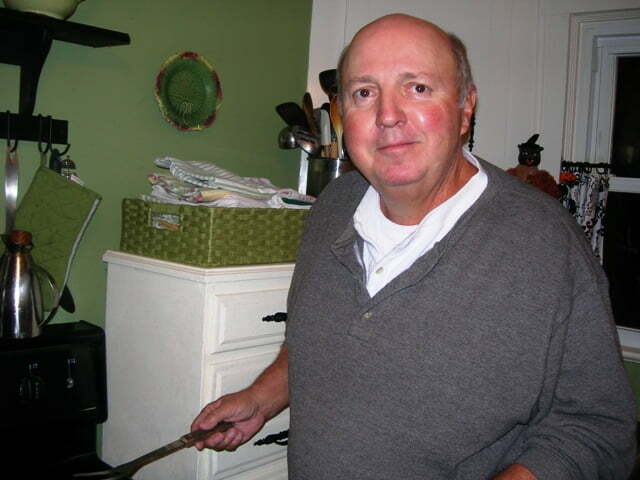 Mother was a wonderful cook and I actually learned how to cook them from my Mother but I did change some after Mrs. Windham shared her recipe with me. Adding the bacon was a good touch. Thank you Leo and Jane for sharing this recipe for all to enjoy. I cook them the same way, minus the water. After frying out the fatback, I just through in the collards ( grease will be popping and sizzling ) and stir. I put as many as the pot will hold, put lid on and simmer. Delicious!! I grow the Morris Heading Collards too and mine are about the same size right now as well. I’ll have to try your method. I saute an onion with 4 cloves of garlic then simmer 4 or 5 ham hocks in vegetable stock for 3 or 4 hours and then add the collards. looks delicious I’ve never made them before (I’m a northern transplant to Georgia!) ! Leo you are the best blogger! I just think your posts are great! Good eating I say! These look delicious, but a lot of work for just me! I would say thats very good eatin!